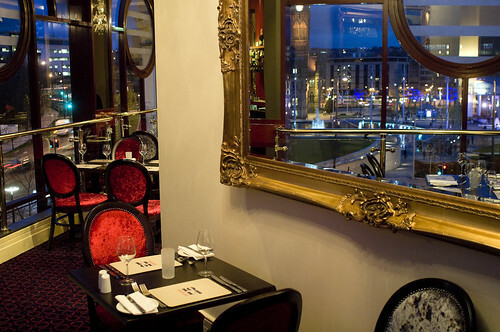 Make your trip to the theatre even more special with a meal in our restaurant. With views over City Park and a seasonal menu full of tempting dishes, it's the perfect spot for a pre-show meal. To view the menu served from 28 January 2019 please click here. This restaurant, located on the Upper Circle level of the Alhambra Theatre, is open on performance days at the Alhambra only: matinees from 12noon and evenings from 5pm. *Bradford Theatres reserve the right to make changes to the advertised menus. Contact us about booking a table here on our contact us page or call us on 01274 431052. For something quick and light before a show, join us at our Circle Café, located on the Dress Circle level of the Alhambra Theatre. You can choose from a selection of freshly made sandwiches, soup, cakes and hot and cold drinks. The Circle Café is open on performance days at the Alhambra only: matinees from 12noon and evenings from 5pm. The Studio offers a selection of drinks for enjoying before a performance or at the interval. On arrival at the venue you can pre order your drinks for the interval and avoid having to queue. On selected evenings the bars will be open after the show. Bradford Theatres offers a range of excellent hospitality packages specifically designed to enhance your group visit. Enjoy a sumptuous dining experience (pre - or postshow) in our in-house 1914 Restaurant. Or why not beat the queues at the bar and restrooms, and meet before the show in The Studio (adjacent to the Alhambra Theatre) to enjoy bespoke refreshment packages, tailored to suit you and your group. All our packages need to be pre-ordered prior to your visit. Please contact the Hospitality Team on 01274 431052 or visit our Contact Page for further information and to discuss your needs.